What does that code mean? In an effort to improve consistency across the University of North Carolina system campuses, the University of North Carolina adopted the Fostering Undergraduate Student Success policy on April 29, 2013 for implementation in fall 2014. To comply with this policy, UNC Wilmington has been putting several changes into place that are effective for all new, continuing and returning undergraduate students enrolled Fall 2014 and thereafter. Students with a low term GPA or a ratio less than 67% of cumulative earned credit hours to cumulative attempted credit hours will receive a "Timely Academic Progress" designation on their transcript, for each term they are not making satisfactory academic progress. Students with a cumulative GPA below a 2.0 will be placed on academic probation. Students will continue to be limited to two semesters of academic probation before being suspended. Rule: Undergraduate students must maintain a minimum of 67% attempted to earned ratio, in order to stay in good academic standing. This new retention policy becomes effective in fall 2014. Current or former students were not previously held to this requirement, thus we have taken a few steps to negate your previous actions, in the implementation of this policy. Note: This SAP ratio is different than your federal financial aid SAP ratio. The academic standing SAP is new (fall 2014) and we're allowing exceptions because continuing students were not previously aware of this policy, when prior withdrawal decisions were made. This is not the case for federal financial aid SAP. Please consult financial aid, if you are identified by their review. You are allowed to withdraw from a total of 16 credit hours, during your entire academic career. A student may drop any or all courses without academic penalty through the end of the first week of the semester. Inclusive of the second through the seventh week of the semester, any student who withdraws from the university or from individual courses will receive a grade of "W" for the first 16 credit hours of course withdrawal. 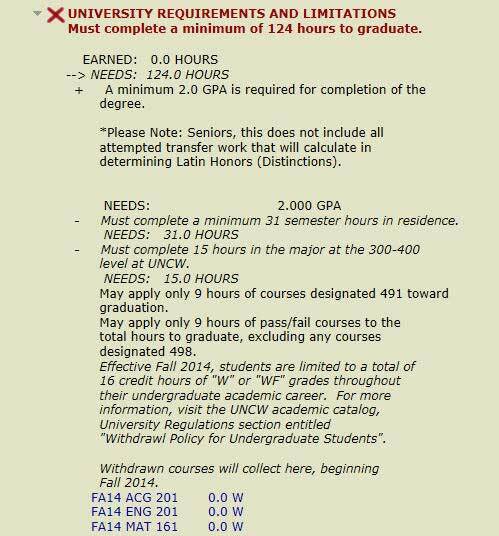 Beginning with the eighth week of the semester, a grade of "WF" will be assigned for each course withdrawal and will count in GPA hours. Any withdrawals beyond the initial 16 credit hours will be automatically recorded as "WF" regardless of the student's performance in the course, at the time of withdrawal. Withdrawals prior to fall 2014, will not be used towards the 16 credit hour limit. Only withdrawals during the fall 2014 and subsequent terms will be counted towards the limit. Partial withdrawals will not be allowed. Partial withdrawals refers to splitting hours within a single course. Example: If a student has withdrawn from 15 hours and needs to withdraw from a 3 credit hour course. Splitting the course into 1 hour under the threshold and 2 hours as WF would not be allowed. Should extenuating circumstances warrant, the grade of "W" or "WF" assigned for course withdrawals prior to the withdrawal deadline or the grade of "WF" assigned for course withdrawals after the withdrawal deadline may be excluded from the 16 credit hour limit. If extenuating circumstances are approved, grades of "WF" will be changed to "W". Documented extenuating circumstances may include: death of an immediate family member; traumatic and unforeseen circumstances which are considered beyond a student's control; serious emotional instability, physical injury or illness which has resulted in the student's inability to complete academic responsibilities in a given term. Students should note that poor standing in a course does not constitute an extenuating circumstance in and of itself. It is the student's responsibility to initiate an appeal for extenuating circumstances by submitting a written request and supporting written documentation. The student must initiate the appeal with the associate dean who oversees the student's major or University College director, as appropriate. The respective associate dean or University College director may approve or deny this request. In cases where the request is denied, the student may submit, within ten regular class days of the dated decision, a written request for consideration with supporting documentation to the Committee on Withdrawal Appeals. Grounds for appeals are limited to substantive new evidence or material procedural irregularity. All decisions made by the Committee on Withdrawal Appeals are final. The written request with supporting documentation must be made as soon as possible after circumstances requiring the withdrawal. At the latest, by the last day of classes in the semester following the one for which the withdrawal is requested. A withdrawal that is not appealed successfully as an extenuating circumstance, will be included in the 16 credit hour limit. For Students: Student Services &Financial Aid > Student Records > What is all the FUSS about? The new F.U.S.S. withdrawn policy has been added to the degree audits. It is under the University Requirements section. W grades will collect here, beginning Fall 2014.